Jack Nitszche | Cue Castanets! The element of Cue Castanets I’m most proud of is the backlog of interviews I have steadily built up since starting the blog little more than a year ago. It’s always fascinating to gain some insights about Spector’s productions or likeminded music from those in the know and share it with fellow music fans – and it is a key element of my blogging that I feel makes Cue Castanets somewhat pick up the baton from the legendary Phil Spector Appreciation Society and their newsletters and fanzines. Since my blog is a one-man operation with only a few occasional, and much-appreciated, guest posts, it’s been important for me to feature opinions from other people on here via interviews as much as possible. Why not check out the list of past interviews via this link to see if you’ve read them all? I’m very pleased to be able to add yet another interview to the blog; this time with music historian Domenic Priore whose work I’ve enjoyed for many years. Domenic is truly a capacity when it comes to 60s Los Angeles / California music lore – he has written about the Beach Boys and dealt extensively with Brian Wilson’s fabled ‘Smile’ album in his fascinating fanzine publication Dumb Angel Gazette that came out in the late 80s. Further Gazettes were later issued before Domenic eventually branched out into books on the 60s California surf pop scene, the LA Sunset Strip and Pacific Ocean Park. To this day, Domenic’s book ‘Pop Surf Culture’, written with fellow music aficionado Brian Chidester, remains one of my all-time favorite books and one that I find myself flicking through several times each year. If you haven’t checked out Domenic’s work yet, you should really do so. Since Domenic is also a big fan of the Wall of Sound, Sony Legacy hired him to write the liner notes for their 2011 ‘The Essential Phil Spector’ 2-CD compilation. With that in mind, I thought it would be interesting to feature some of his views in interview-form for Cue Castanets. So Domenic, what’s your earliest associated memory with the Wall of Sound & Phil Spector? Was there a specific song that made an impression on you and won you over, so to speak? The Ronettes, when I was a little kid. I remember hearing “Be My Baby” during a summer vacation to New York City in 1963 (we drove there from Los Angeles, partially on Route 66), then “Baby I Love You” and later “Walking In The Rain,” … which I remember being in pre-school and running down the stairs in front of the big brick schoolhouse and doing some kind of Gene Kelly “Singing in the Rain”-type dance on the stairway, because I associated “Walking in the Rain” with “Singing in the Rain” when I was 4. You’re one of the leading experts on Los Angeles pop history having researched the city’s history extensively and written some fine books on the subject. How would you briefly characterize Spector’s significance and influence in Los Angeles music circles; both in terms of his ‘sound’ and the way he went about building up Philles Records? Well, he really consolidated the idea of the Wrecking Crew, I mean, some of them had played together on other things but in 1963 you get them playing on “Be My Baby” (Ronettes) and “Surf City” (Jan & Dean) and pretty soon Brian Wilson starts to use them as well. But it was more than the musicians, but the sound design concept; that was the key. Phil Spector’s Wall of Sound had romantic, ethereal elements to it, as well as direct things, like a strong beat, or a noisy atmosphere similar to Frank Gaudia’s party-room production on the Gary U.S. Bonds single “Quarter To Three”. All those things got mixed into a big pot, and some of it actually had to do with Hollywood movie soundtrack production motifs. You got to figure Phil’s closeness to the Big Screen Spectaculars and the grandiose sound of that… there was a reductionist exercise Phil did taking that down to a 45 that also came on strong with the rock ‘n’ roll core not found then in movie soundtracks. Ultimately Jack Nitzsche, who arranged Phil’s records, becomes a soundtrack-maker later on, so this played well in context. Nitzsche also did tremendous work outside of the Philles sides, including a session with Phil, Mick Jagger and Keith Richards at RCA Music Center of the World at 4 a.m. in the morning that became “Play With Fire”. Andrew Loog Oldham explained to me that this was the moment The Rolling Stones went from being a band who covered R&B styles to becoming the kind of group who could write expansive things like “Paint It Black,” “Ruby Tuesday” and “We Love You”. Jack Nitszche to the left at a 60s session. So it’s really hard to sum up Phil’s overall influence on not only the L.A. scene but on things like The Beatles’ Sgt Pepper’s Lonely Hearts Club Band and The Beach Boys’ Pet Sounds. During Spector’s heyday, LA was thriving with young, exciting bands playing the clubs at Sunset Strip, a scene you’ve devoted a whole book to, the brilliant “Riot on Sunset Strip – Rock’n’roll’s Last Stand in Hollywood.” What would have been some of Spector’s favorite haunts, if any? We know that Phil worked with The Modern Folk Quartet on “This Could Be The Night” which was the theme to The Big T.N.T. Show. He also orchestrated things like that amazing live rendition of Petula Clark’s version of “Downtown” there at the Moulin Rouge. That is a most incredible piece of footage. From what I hear, Phil also sang on stage with The Modern Folk Quartet at The Trip, and there was a legendary meeting written up in the L.A. Free Press about Phil meeting Bob Dylan at the Fred C. Dobbs coffeehouse across the street from The Trip. Some kid put “Let’s Go Get Stoned” by Ronnie Milsap on the jukebox and supposedly that led to Dylan’s writing “Rainy Day Women #12 and #35”. So you can say Phil was definitely on the scene. He was also parodied in “The Cool Ones” and parodied himself on that episode of “I Dream of Jeanie”. Brian Wilson has often referred to Spector’s records as a primary influence in expanding the sound and artistry of the Beach Boys. You’ve met both Brian Wilson and Phil Spector. What, in your opinion, are their biggest similarities and differences? Well, I didn’t meet them in the ’60s and you have to remember they are tremendously different people now, compared to then, when they were making their best records, without question. Brian Wilson seems to have been able to “let go” of what began as a competitive nature, whereas Phil seemed obsessed with competition. In the end, the ’60s were not about that old “me vs. you” thing, it became about cross-pollination, getting together, and making changes for the better. Brian Wilson clearly reached for this, whereas Phil Spector may have wanted those things to happen, but personally was more wound up within the old-fashioned competitive mode. Besides Brian Wilson, numerous LA-based producers took notice of the Wall of Sound and tried to go for a similar feel on their own 60s output. Are there any specific producers or releases of the time that you’d like to highlight for whatever reason? In the Revised Edition of “Riot on Sunset Strip: Rock ‘n’ Roll’s Last Stand in Hollywood” I have a section where I boil it down to four record producers who stood above all the rest in L.A., and they would be Phil Spector, Jack Nitzsche, Brian Wilson and Lee Hazelwood. 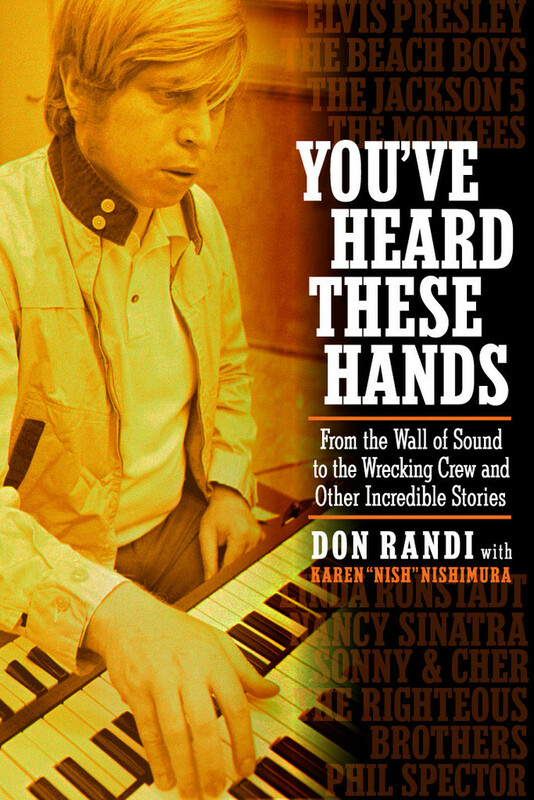 Domenic’s revised edition of “Riot on Sunset Strip” contains a whole section about Phil Spector and similar Wall of Sound records. Nitzsche and Hazelwood actually worked together a bit on brilliant things like The Wildcats “What Are We Gonna Do in ’64” but you have to look at things like Lee Hazelwood’s production on “Some Velvet Morning” (Nancy Sinatra) and Jack Nitzsche’s “Expecting to Fly” (Buffalo Springfield) to really get the big picture there. Darian Sahanaja, later of the Brian Wilson band and The Wondermints, did a pretty thorough article in the first issue of Dumb Angel Gazette back in 1987 that is still the best guidebook to Nitzsche’s coolest records. The odd thing with Nitzsche is that he is not always credited as producer but you know those records have his stamp. Brian Wilson, it’s pretty obvious things like “Beach Boys Today!” and “Pet Sounds” have that Phil Spector tone, though with “Pet Sounds” it really becomes a Brian Wilson sound on that one. I think Nitzsche, Wilson and Hazelwood took out some of the noise and brought more clarity into the so-called Wall of Sound. Speaking of Wall of Sound influenced music, if you have some personal Spector soundalikes from any era you’d like to recommend Cue Castanets readers to check out, by all means, please do! I always think of “My One and Only Jimmy Boy” by The Girlfriends and “Ooh Chang A Lang” by The Orchids for some reason, and then “Dream Baby” by Cherilyn (Cher)… the 45 version, the one on the LP doesn’t have the right mix, remember that. There are a ton of Phil Spector influenced records and I might be forgetting about a few favorites of course, but those three are the ones I think about first. I’d like to dwell a bit on Spector’s output again. How do you feel about the stereo versions of the 60s productions that have crept out? I dig them myself but I know other fans really dislike them because of their simple stereo separation. The only thing I remember hearing in stereo is The Ronettes album which is okay but inferior to the mono pressing. I think people who prefer stereo most likely don’t know how to dance, or, you know, don’t get out much. There’s also the question of the Spector tape vault, – whether or not there is more stuff tucked away on those fabled tapes. Do you think there are more unreleased 60s recordings than what has eventually came out on the wonderful Rare Masters vol. 1 and vol. 2 collections? According to rumors at the time of their issue, there was at least enough material for a third volume? I’m not too sure of what does exist, I mean, in the ’70s they did a pretty good job of getting things out there like “I Wish I Never Saw The Sunshine” and most likely the best things are already out there. There is a Harry Nilsson vocal that Phil produced during the mid-’60s, a demo for “Let Me Go,” which is a Righteous Brothers-type thing that was later released by Pat & Andre. What is really interesting is just listening to the Phil Spector sessions which have to be considered historical. You’ll never get sessions like that again, and hearing him in the studio direct things like “Be My Baby” or sessions from the Christmas album is an education. I recall hearing some MFQ sessions that were pretty interesting and I think there was more than “This Could Be The Night” though I don’t think the MFQ sang … those would be incomplete but fascinating. How do you feel about Spector’s 70s productions? As with the 60s stereo versions, these productions tend to divide the waters with some really loving them and others finding them un-imaginative and tired. How do you feel about this phase of his career? Something in the ’70s, unimaginative and tired? Nahhhhh…. not the ’70s! I’m being facetious, of course. The ’70s were notorious for not having the kick the ’60s did, for being bombastic, self-absorbed, bland, all those things that led to punk rock becoming the most important movement to emerge since The Beatles came out. Phil’s work with The Ramones on “Do You Remember Rock ‘n’ Roll Radio” can be considered AS GOOD as the things he did during the ’60s… the message in the lyrics of that song summed up so much, and were similar to those in Elvis Costello’s “Radio, Radio”. Phil, I think, and The Ramones, probably felt those lyrics deep down in their souls, this was really a song they could get behind the meaning of, when they say ‘we need change and we need it fast’… how horrible did broadcast music become after, say, 1971? You’ve got to figure “(Do You Remember) Rock ‘n’ Roll Radio” is a statement, and that’s what made the best records of the ’50s or ’60s stand out, whether it was “Rock ‘n’ Roll is Here To Stay,” “Will You Love Me Tomorrow” or “Give Peace A Chance”. When you listen to the Nilsson tracks, the Cher tracks, yeah, they lack life, but in another sense I find them interesting to listen to. Maybe it’s a good thing Phil didn’t do much during that period. The Jeri Bo Keno record was probably the best mid-’70s thing, in fact, but that only harks back to his early stuff, without matching it. It is appealing… for that depressed musical era. His work on “Imagine” and “All Things Must Pass” is still unquestionably great, prime-era style, as we saw with “Black Pearl”. “Instant Karma” is my favorite John Lennon solo record, but also keep in mind those were all prior to 1972, when navel-gazing material such as Gilbert O’Sullivan’s “Alone Again, Naturally” was the order of the day. It was a mediocre time for music, and tough for Spector to really fit in to that with the Cher or Nilsson tracks cut during that period. It’s tough also to comment on the Leonard Cohen and Dion albums because they come out of that more flaccid frame of mind, prior to one final return to greatness for Phil with The Ramones. In fact, few of the rockers from the ’50s or ’60s really understood why punk rock was necessary, so the fact that Phil made a great record with The Ramones, easily the most influential band since The Beatles, is to his credit. Thank you for your insights, Domenic. I’d like to ask you one final question; one I end all my interviews with. Could you please share with us your personal top 5 Spector productions? I know it’s a grueling task but it would be interesting to see which songs are among your favorites. “River Deep, Mountain High” is up there, “This Could Be The Night” is up there, “Baby I Love You,” “He’s A Rebel” without question… does “Home of the Brave” by Bonnie & the Treasures count? Sure, I’ll let that one slip under the radar even though we have Jerry Riopelle to thank for that gem. But it remains perhaps the most convincing, high quality Spector soundalike ever. Again, thank you for taking your time to talk with Cue Castanets.